​My New Book Is Now Available! ​I agree by signing up here I understand I will receive frequent email updates, offers, and ​marketing ​​tips from Richard Emmons. 1. How to get your product or service in front of people who are interested. This is the first problem that must be overcome. If you can’t get your product or service in front of interested people then you cannot make money. Richard Emmons creates strategies and tactics to help you overcome this problem. 2. How to get the people who are interested to buy from you and not your competitors. Once you have solved the first problem then, of course those people have to buy from you and not your competitors. Using proven sales and copywriting techniques that increase conversion rates, Richard Emmons helps you get more clients. 3. How to get the people who do buy from you, to buy more and buy more often. The final problem is to get one-time customers to become frequent and continuous clients. Using proven business growth techniques, Richard Emmons helps you solve this problem. Since 2007, millions of American companies went out of business because they couldn’t solve the above three problems. The 2008 recession blindsided a lot of prospering businesses. Don’t let the next recession destroy your business because of the same three problems. 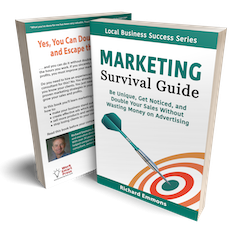 Your first step to overcome these problems is to read Richard's new book, Marketing Survival Guide. Click here to learn more. Contact Richard Emmons today to schedule a no cost “Rapid Business Growth Analysis.” This “marketing audit” will uncover the “profit leaks” and hidden marketing assets within your business and determine if we can work together to grow your business.